The latest Phat Quarter swap theme was books and my partner's favorite author was Haruki Murakami. I did some research and decided to read his book Norwegian Wood and create something based on that. I wanted to do something to capture the mood of the book. There were a number of forest/outdoor scenes so I used that as the basis for the piece. I wanted to keep the detail simple and just added a single green butterfly, to represent the 2 main female characters, Kaoko and Midori. Toru: "Nobody likes being alone that much. I don't go out of my way to make friends, that's all. 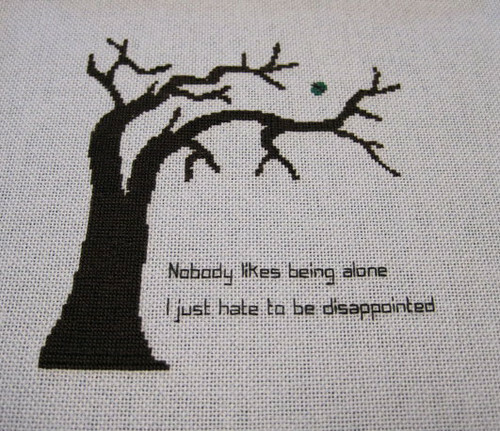 It just leads to disappointment"
Midori: "Nobody likes being alone. I just hate to be disappointed." You can use that line if you ever write your autobiography. The piece is on light blue 28 ct fabric. It's the first time I've worked on 28 ct which took some time to get used to. At times the stitches seemed way too small to be right. 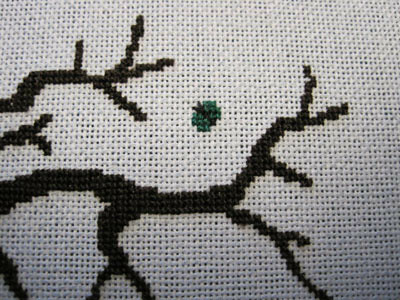 But everything turned out pretty nicely, other than the butterfly, which looked great in the pattern but looks like a blob stitched. This is beautiful work inspired by a beautiful book. I love it.